I’ve been fortunate in the 15 years of running ClintonFitch.com to review dozens of cases. However, every time I’m offered the opportunity to review a case from Noreve, I never turn down it down. Their cases are simply superb. They look and feel stunning and provide an excellent measure of safety and security for your phone and table. 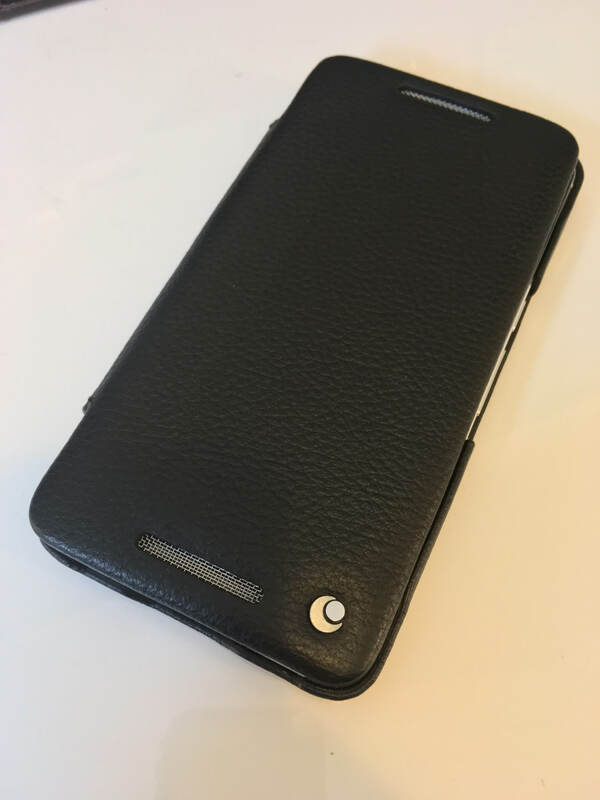 The Ambition Folio case for the Nexus 6P is no exception. It is a premium case that fits the billing and you won’t be disappointed should you choose to get one for your 6P or the dozens of other devices they make cases for in France. cradle your phone perfectly, protecting it on the sides while also giving easy and unobstructed access to the buttons, ports and camera. To install your phone into the case, simply slide the right edge (the power button edge) into the case then push down on the left side to snap it in place. Once in, you will find that the case holds the phone securely. The case is hand constructed, using high quality leather. The feel and smell of the leather is excellent, invoking a sense of style as well as luxury. This case feels good simply holding it. The front flap covering the screen of your phone is slightly padded and attached with a leather binding to the back of the case. Looking at the stitching around the front inside edge, you will find them tight and uniform, another indicator of the quality of this case. Inside the case, on both the cradle for your phone and the front flap, you will find the Noreve name continually stamped into the leather. 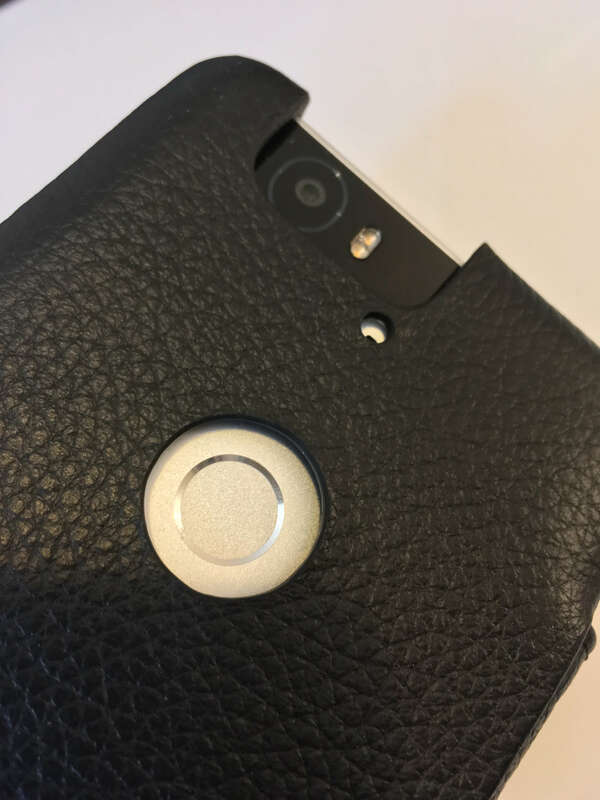 On the front flap of the case you will find two sterling silver grills where the speakers of the Nexus 6P and, of course, the Noreve icon, in silver, attached to the front. As has been the case with other Noreve cases that I have reviewed, the Ambition folio for the Nexus 6P clearly was designed to precisely fit this phone. Access to all of the buttons, ports and cameras on the 6P are easily accessible so you are not having to fumble about to find them. Further, the camera, flash and fingerprint scanner on the back are unobstructed. If you need to work on your Nexus 6P, the front flap of the case easily folds behind the back of the case, allowing you to easily, and with a bit more area to grip, hold your phone for two handed operation. Charging your 6P is no problem with the case on it either as access to the USB-C port is provided thanks to a cutout in the bottom edge of the case. Frankly, once you get this case on your phone, there is hardly a reason to remove it. To be sure, it does add some bulk to your 6P but the stylishness and functionality makes up for it in my opinion. To view the entire lineup of Noreve cases, visit their website. For the Ambition Folio case for the Nexus 6P, it is $54.99 with free shipping.